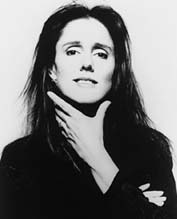 Julie Taymor '74 is creator of the Broadway megahit The Lion King: The Musical. Since the blockbuster -- sold out until 1999 -- premiered at the New Amsterdam theater in Manhattan last fall, Taymor's name, already well-respected in theater circles, has virtually become a household word. Oberlin's own eminent theater scholar, Roger Copeland, says, "Genius is a word that I use very sparingly and advisedly, but I do think she's a genius, and one of the few working in the theater today." Since childhood, Taymor was on a trajectory to success, producing plays at 7 in her backyard in Newton, Massachusetts, and studying with Boston Children's Theater at 9. Her interest in Asian theater began at 15 when she traveled in India and Sri Lanka as part of an educational program, and, at 16, she was studying in Paris with legendary mime Jacques Le Coq. 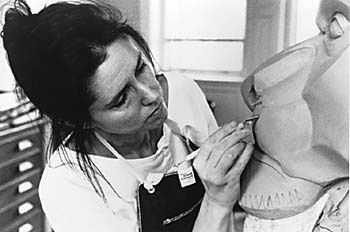 In Taymor's junior year at Oberlin, postmodern director Herbert Blau, who had just established a professional theater company at the College, accepted Taymor into his program and thrust her into the group process he favored. It was there that she learned how to put a collaborative piece together, that, she says, became the basis of all her original work. At the same time, she worked on her independent major in mythology and folklore. "To me that was more theater study, because I studied shamanism, and religion, and the origins of theater. What I learned in those courses was tremendously important, then and now. In 1974 Taymor graduated Phi Beta Kappa with honors and with a Watson traveling fellowship that took her to Indonesia and Japan. In Bali, seeing a ritual performed in the woods, without an official audience, affected her deeply. She realized, "This is what it means to perform for God! What made me stay there for four years was an environment where theater was an everyday thing, not an exclusive event for a rarefied audience. Having the neighborhood kids sitting around as we were rehearsing on our porch, or watching the way children in Bali sit on their parents' laps in the Suzuki manner as they were playing gamelan, was very profound." With her most recent work, Taymor tackles issues which, though they are everyday realities for many Americans. are rarely discussed. "What I love about The Lion King," says Taymor, "is that this is a show with a predominantly nonwhite cast that is not about race. On the other hand, it's all about race -- and that should be acknowledged, because there are very powerful traditions from a certain race, and that fact shouldn't be ignored. "We shouldn't have to think about it," the Disney people insisted. "And I was saying, 'No, you're absolutely wrong. We are absolutely going to think about race here. We're going to have a person representing the king on that mountain and he's going to be wearing African-inspired clothes.' White people may say that race doesn't matter, but to black people, race matters, totally. As some have told me, 'It's the first time my son has seen a black person representing a king on stage.' That moment at the top of the mountain is the first time he's seen in a position of power, the father kindly talking to his son about what it's going to be like to be king -- something that white people take for granted, but it's very, very powerful. America is up on stage, and, I hope, the future of America, where race is interchangeable. "The Disney people knew who I was and had followed my career from a distance. I knew very clearly from our first meeting that they wanted what I had to offer, because we tread in the same waters of folklore, of stories that are cross-cultural. But I have a completely different way of telling the stories. The Lion King is a high-tech, low-tech production. Geysers spout, the dead Mufasa's face appears from a heaving mass of clouds and rocks, and drought is signaled simply by a blue cloth slowly disappearing into a hole. The images that have moved people, and shocked them, are from Asia; from shamanistic practices I learned from reading; from what I experienced living in Japan and Indonesia; and from the Africans with whom I'm working. These images are as old as the theater." Taymor's past productions range from original musicals and Shakespeare -- Juan Darien and Titus Andronicus -- to classical operas and original films -- The Magic Flute, Stravinksky's opera-oratorio Oedipus Rex, and Fool's Fire. She has collaborated with distinguished artists Jessye Norman, Seiji Ozawa, and Zubin Mehta, and with topnotch stage and film actors, including Avery Brooks '70. Taymor's awards include a Tony for Juan Darien, an Emmy for Oedipus Rex, a MacArthur Foundation Fellowship, a Guggenheim Fellowship, two OBIE awards and the Brandeis Creative Arts Award. "If Oberlin continues to allow young people the opportunity that I've had -- to really create their own intellectual activity -- then I think it's a wonderful institution," says Taymor. Betty Gabrielli is senior staff writer for the Department of College Relations.